All nine lines of Tokyo's subway system were suspended temporarily after recieving warning of a North Korean missile launch. It was the first time a service had been stopped in response to a missile launch. (by Eileen AJ Connelly, New York Post) – Tokyo’s subway system briefly shut down Saturday as a safety precaution after North Korea test-fired a ballistic missile in defiance of [the UN Security Council and] a US push for tougher global sanctions. 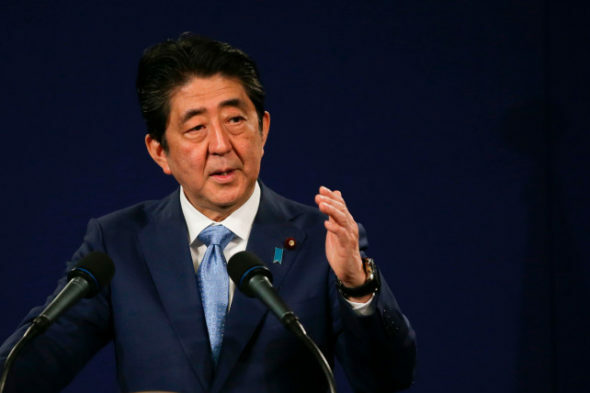 Prime Minister Abe added that he agreed with Russian President Vladimir Putin that Russia, China, Japan, the United States and South Korea all need to cooperate closely on the issue. Saturday’s subway shutdown was the first on the Tokyo Metro under new rules calling for safety checks in response to news of the launching of any missile that could potentially hit Japan. The trains were stopped about a half hour after the missile launch and at the beginning of the annual Golden Week, a series of national holidays. About 130,000 people were affected, Kyodo News said. [Train service stopped for about 10 minutes in response to news that the North had launched a missile. It resumed operations after receiving no further update, spokesman Noboru Ishikawa said. 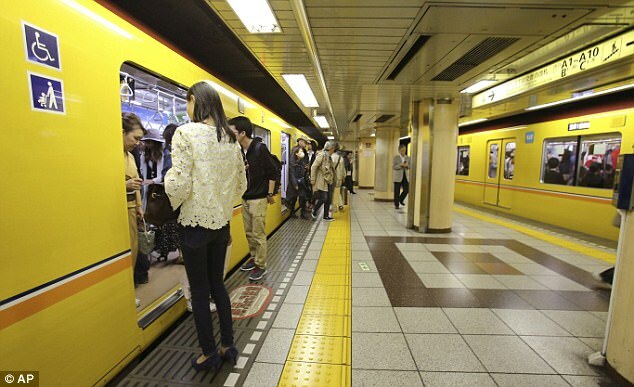 This was the first time Tokyo Metro had ever taken such a safety precaution, Ishikawa said, adding that the discussions on the emergency measures were held in mid-April. Saturday’s stoppage was ordered in accordance with the consensus reached at the meeting, he said. Although subways are generally considered safer from missile attack than transportation above ground, the measure is nonetheless necessary to let trains temporarily stop at nearby stations so passengers can evacuate, Ishikawa said. 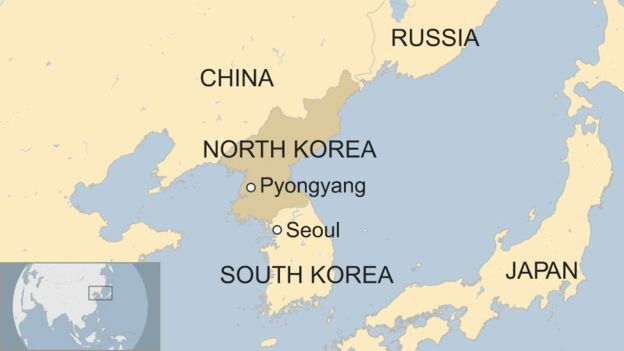 North Korea fired its missile just hours after US Secretary of State Rex Tillerson warned the UN Security Council of “catastrophic consequences” if the international community, particularly China, fails to pressure the North into abandoning its weapons program. Meanwhile Saturday, the USS Carl Vinson aircraft carrier kicked off a joint drill with the South Korean navy. The drill is intended to verify the allies’ capability to track and intercept enemy ballistic missiles, a Navy spokesman said. The drill will also include a live-fire exercise and anti-submarine maneuvers. President Trump has warned of a possible “major conflict” with North Korea, and insisted that “all options are on the table” to stop its nuclear drive. 3. What was unusual about the Tokyo Metro shutdown? 4. What was the purpose of the shutdown? 5. Why is the Trump administration asking China to pressure North Korea to give up its nuclear weapons program? 6. a) Read the “Background” below the questions. What is President Trump’s strategy (foreign policy) for addressing the serious threat from North Korea? b) The North Korean nuclear weapons program has not been solved during the 16 years of the Bush and Obama administrations. It must be addressed by world leaders. Regardless of whether you like President Trump or not, what do you think of his strategy for dealing with North Korea? 7. After his father died, Kim Jong Un took over as supreme leader of the Democratic People’s Republic of Korea (DPRK), commonly referred to as North Korea in 2011. Since that time, he has never met with any world leader. President Trump said Monday he would be willing to meet with North Korean leader Kim Jong Un “under the right circumstances” to defuse tensions over North Korea’s nuclear program. No US president has ever before met with the leader of North Korea, and the idea is extremely controversial. White House press secretary Sean Spicer, however, said later on Monday that the US would first need to see changes in North Korean behavior before a potential sit-down. The North Korean nuclear issue has quickly become one of the top national security concerns for the Trump administration and administration officials have repeatedly stressed the increasing urgency of the situation. President Trump has focused on finding a diplomatic solution to the North Korean issue — working increasingly closely with China — but has also refused to rule out a military solution to the problem. Years of “Six Party Talks,” humanitarian aid to North Korea, economic sanctions against North Korea have failed in causing the volatile government of North Korea from ending its nuclear weapons pursuit. What do you think of President Trump’s offer to meet with Kim Jong Un to solve the nuclear crisis? (crazy, an interesting idea, good strategy, etc.) Explain your answer. The Japanese government is preparing its citizens in case a missile comes their way — possibly with less than 10 minutes’ warning. President Donald Trump on Sunday stepped up outreach to allies in Asia to secure their cooperation to pressure North Korea over its nuclear and missile programs. President Trump spoke to the prime ministers of Thailand and Singapore in separate phone calls about the North Korean threat and invited both of them to Washington, U.S. officials said. “They discussed ways to maintain diplomatic and economic pressure on North Korea,” one U.S. official said of the calls, speaking on condition of anonymity. Mr. Trump’s calls to the two Asian leaders came two days after North Korea test-launched another missile that Washington and Seoul said was unsuccessful but which drew widespread international condemnation. President Trump talked on Saturday night with Philippines President Rodrigo Duterte, who was also invited to the White House. Duterte has been criticized by human rights groups for an anti-drug campaign in which more than 8,000 people have died. A week ago, Mr. Trump spoke with the leaders of China and Japan on the North Korea issue. “We need cooperation at some level with as many partners in the area as we can get to make sure that we have our ducks in a row,” White House Chief of Staff Reince Priebus told ABC’s “This Week” earlier on Sunday. Mr. Priebus said the conversations were prompted by the “potential for nuclear and massive destruction in Asia” and eventually in the United States. The U.S. president, who warned in an interview with Reuters that a “major, major conflict” with North Korea was possible, did not elaborate on any U.S. response to the test. “You’ll soon find out,” he said on Saturday. President Trump has stressed he would not broadcast military options to preserve an element of surprise. His secretary of state, Rex Tillerson, said on Friday all options remained on the table. Mr. Priebus said President Trump was in regular contact with Japanese Prime Minister Shinzo Abe and that the president had become “very close” to Chinese President Xi Jinping. Mr. Trump, for whom China was a virtual punching bag during the 2016 presidential campaign over trade, told CBS that any trade disputes with the Asian economic giant took a back seat to securing its cooperation on North Korea. “Trade is very important. But massive warfare with millions, potentially millions of people being killed? That, as we would say, trumps trade,” President Trump said in the “Face the Nation” interview. China, North Korea’s only major ally and its largest trading partner, has expressed increasing concern about Pyongyang’s pursuit of nuclear weapons and long-range ballistic missiles in violation of U.N. resolutions. Similarly, concerns over human rights in the Philippines, where critics cite extrajudicial killings in Duterte’s war on drugs, take a back seat to possible confrontation in Asia. “There is nothing right now facing this country and facing the region that is a bigger threat than what is happening in North Korea,” Mr. Priebus said in the ABC interview. Thailand Prime Minister Prayuth Chan-ocha, a former general, heads a military-dominated government that took power in a 2014 coup. His government had strained relations with President Trump’s predecessor, Barack Obama. It was unclear whether the consultations meant Washington was preparing imminent action against Pyongyang. Adam M. Smith, a former Obama administration official…said it was notable that President Trump was talking to the money centers in Asia – Singapore and Japan – and reaching out to some countries in the region, including the Philippines, that have been unwilling to go beyond what was required by U.N. sanctions.